Doberman Pinschers sometimes get a bad reputation from pop culture. In movies and cartoons, they are always portrayed as tough guard dogs, or part of the “bad guys”. 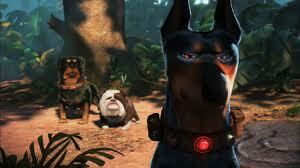 The best pop culture Doberman reference I could find was the leader of the island dog pack, Alpha, in the movie “Up”. He gave us gems like “Now you must wear the cone of shame.” and “Mayhaps you desire to – SQUIRREL!”. 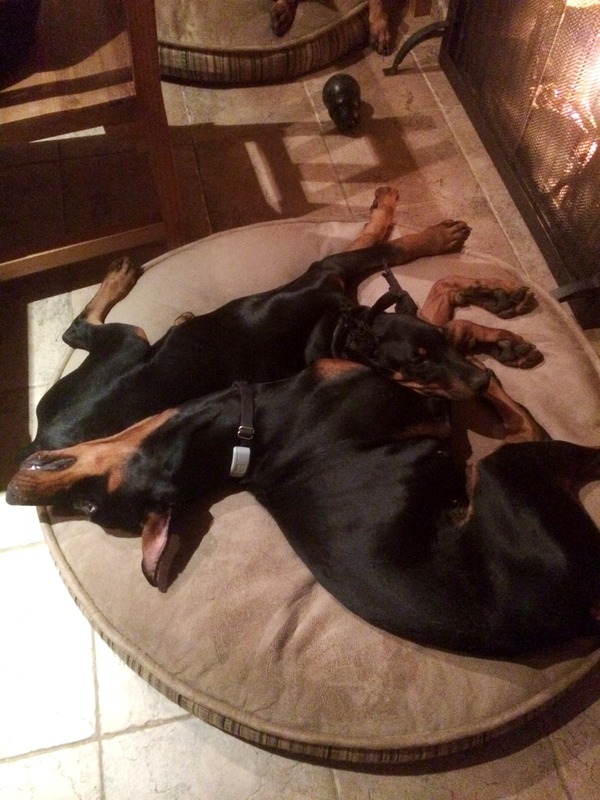 Dobermans were bred to be the tough, intimidating guard dogs they so often are portrayed as. The breed was developed in the late 1800’s by a German tax collector who wanted dogs to help protect him during his collection rounds. He was looking for a combination of strength, speed, endurance, loyalty, intelligence, and ferocity, though in my experience, the ferocity trait got lost somewhere along the way in our modern Dobes. During World War II, the United States Marine Corps adopted the breed as war dogs after seeing their bravery and athleticism and brought them back to North America. On those hot summer days, Hunter likes to cool himself off in his very own pool. 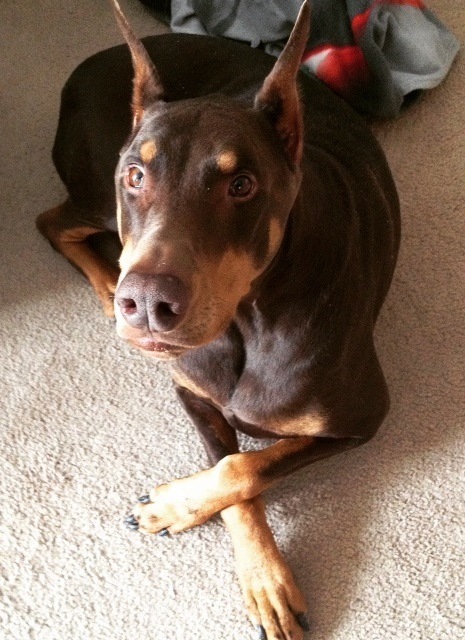 Today’s Dobes are still athletic and intelligent but they are also incredibly affectionate dogs. These traits make them perfect police dogs, but also fantastic companions. They are very attached to their people and eager to please, which makes them very trainable. They range from 70-100 lbs, and even at that size, I know many Dobes that still think that they should be lap dogs. Most have the classic black and tan coat colour but they can also come in red, blue, and fawn. The classic appearance features a docked tail and cropped ears. Both of these modifications are strictly cosmetic, and as such, are falling out of favour so we are seeing more and more long tailed, floppy eared Dobermans. It’s a much softer, kinder look, which I think matches their companion animal status. Dobes are very athletic and need regular exercise to keep from gaining weight. They generally live up to 10-11 years old. The most common medical problem we see is heart disease, specifically dilated cardiomyopathy, which usually presents at middle age. Somewhere in their ancestry, a bleeding disorder called Von Willebrand’s Disease got into the lines. This disease can cause excessive bleeding, but breeders are doing a very good job in breeding it out and we are seeing less and less cases over the last decade or so. As a large breed dog, we can also see various cancers as they age and mobility problems like hip dysplasia, but as long as they stay a healthy weight and are active, we can usually keep orthopedic problems under control. I’d now like to introduce a few of Goldenvale’s Doberman patients. 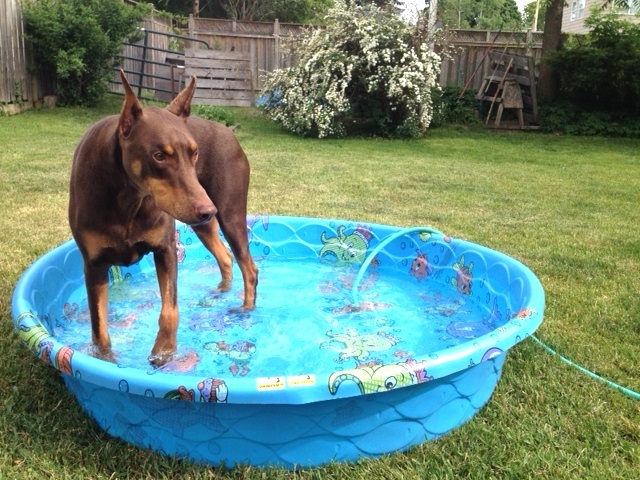 Below is Hunter; a 5 1/2 year old red Dobe. Always the gentleman, this is how he waits for his dad to get home! Wittlesbach (1 year old), Mecklenburg (4 months), and Eugen (13 years old) would also like to say hi. 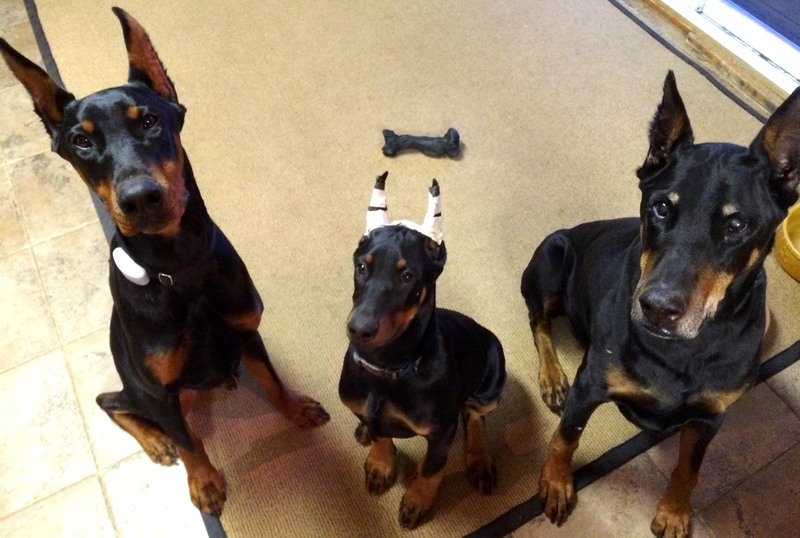 These 3 boys are the perfect picture of how loyal to their human Dobes can be. Their mom can let them outside and instead of playing with each other in the 2 acre yard, they turn around and stare through the door waiting for mom to come out with them. Trivia Answer: Chow Chows and Shar-Peis naturally have black or very blue tongues. For new owners of these breeds, it can come as a bit of a shock! Question: Do you know how heartworm infection is spread?